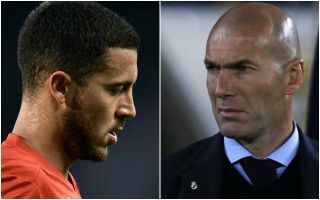 Real Madrid manager Zinedine Zidane is reportedly considering an alternative plan to the transfer of Chelsea’s Eden Hazard – a move for West Ham winger Felipe Anderson. This surprise claim comes from Sky Sports, who claim the Brazilian flair player could cost around £65million, with Chelsea having just rejected a bid of around £60m for Hazard. Anderson was considered something of a prospect for much of his time at previous club Lazio, before his form took a bit of a dip in Serie A. The 25-year-old has since got back to his best in the Premier League with West Ham, though one wouldn’t necessarily have immediately thought of him as someone who’d be on Real Madrid’s radar. Hazard has been strongly linked with Madrid for some time now and will surely continue to be their first choice, but it would certainly be interesting to see if they ended up moving for Anderson instead. West Ham won’t want to lose their in-form star, but one has to wonder if Real’s interest could also lead to other big sides taking a look at him ahead of the summer.